Monarch Gold holds a 100% interest in the Croinor Gold property, an advanced gold project that is currently at the prefeasibility stage. The property consists of one mining lease and two non-contiguous blocks of claims for a total of 335 claims over a 151 km² area. A 1.5% NSR is applicable on the mining lease and only 44 claims. The Croinor Gold property lies in the Haig, Pershing, Tavernier, Tiblemont and Vauquelin townships, approximately 55 km east of Val-d'Or (75 km by road) and 27 km east of Louvicourt, the nearest town. The property is located in the municipality of Senneterre. Pershing township has been explored since the early 1930s. The Croinor deposit was discovered in 1940. Several companies subsequently conducted exploration on the property. * Source: Monarch prefeasibility study (January 19, 2018) and resources estimation (January 8, 2016). The independent Qualified Persons for the mineral resource estimate, as defined by NI 43-101, are Karine Brousseau, Eng., and Carl Pelletier, B.Sc., P.Geo. (InnovExplo Inc.); the effective date of the estimate is November 6, 2015. The results are presented undiluted and in situ; the estimate includes 51 gold-bearing zones, some of which contain resources below the cut-off grade. 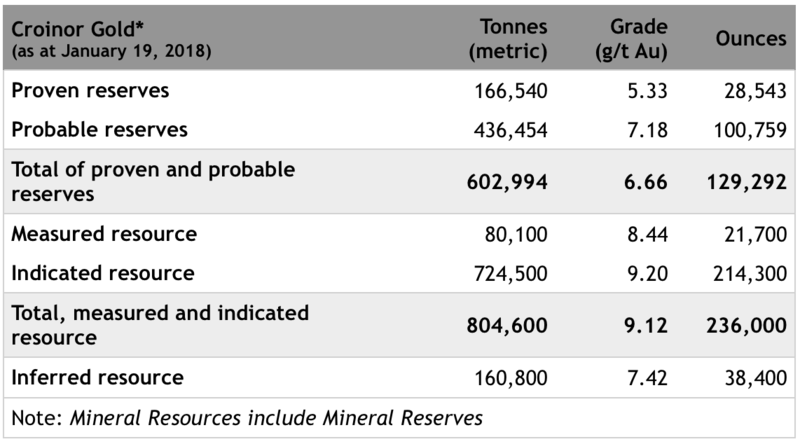 The mineral resource was compiled at cut-off grades of 3, 4 and 5 g/t Au; however, the official resource is at a cut-off grade of 4 g/t. 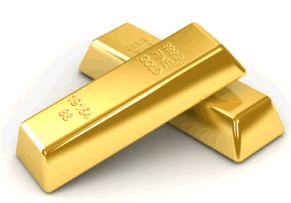 The cut-off grade should be reviewed in light of prevailing market conditions (gold price, exchange rate and mining cost). A density of 2.8 g/cm3 was used for the mineralized zones and the waste rock. A minimum true thickness of 1.8 m was applied, using the grade of the adjacent material when assayed, or else a grade of zero. High-grade capping was applied to the raw assay data, and was established at 70 g/t Au for the diamond drill core and 55 g/t Au for the underground channel samples. Compositing was done on drill hole sections and underground channel sections falling within the mineralized zones (composite = 1 metre). Resources were estimated using GEOVIA GEMS 6.7 software from diamond drill holes and underground channel samples using an ID6 interpolation method in a block model (block size 5m x 2.5m x 2.5m). The measured, indicated and inferred categories were defined using the parameters for the various passes. Isolated blocks in the indicated category showing no spatial continuity in terms of grade and/or information density were reclassified from indicated to inferred. Blocks in the Inferred category showing good spatial continuity in terms of grade and/or information density were reclassified from inferred to dedicated. Ounce (troy) = Metric tons x Grade / 31.10348. Metric units (metres, tonnes and g/t) were used in the estimate. The tonnage estimate was rounded to the nearest hundred tonnes. Any discrepancies in the totals are due to the rounding effect; rounding followed the recommendations in Form 43-101F1. 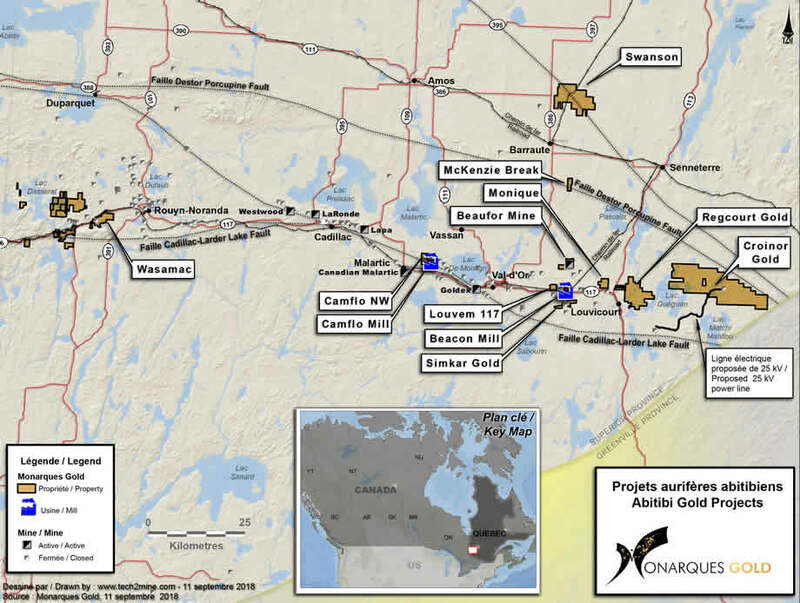 The Croinor Gold property is located in the eastern part of the Archean Abitibi Greenstone Belt in the southern Superior Province of the Canadian Shield.The Abitibi Greenstone Belt is one of the most extensive continuous expanses of low metamorphic grade Archean volcanic and sedimentary rocks in the world. The Croinor Gold property is underlain by two major lithological packages—the dominantly volcanic Assup Domain in the north and the dominantly sedimentary Garden Island Domain in the south. The Assup Domain is further divided into the mafic volcanic Aurora Group in the south and the mafic to intermediate volcanic Assup Group in the north (dominantly mafic). The Pershing Batholith overlaps the southwest end of the property. The Croinor Gold property is transected by the Garden Island Deformation Corridor in a northwest-southeast direction, which overprints and partially follows the contact between the Assup and Garden Island domains. The Croinor Gold deposit is hosted by the synvolcanic Croinor Sill. This dioritic sill is from 60 to 120 m thick and hosted within volcanic rocks of the Assup Domain. The deposit is characterized by gold-rich lenses consisting of quartz-carbonate-tourmaline-pyrite veins, altered pyritic host rock material, and/or tectonic breccia (pyritic host fragments within a quartz-carbonate-tourmaline-pyrite vein). The mineralized lenses range from 60 to 120 m long. The lenses can generally be followed from one section to another (10 m sections) over lateral distances varying from several tens of m up to 600 m. To date, about 40 gold-rich lenses have been identified. Many other showings have been explored to a degree ranging from trenching to drilling. In most cases, gold mineralization is found in vein systems within or associated with dyke, sill or pluton intrusives within the volcanics. The known showings are Gold Bug, Croinor-Trench 2, Bug Lake, Pershon, Rocheleau-3, Rocheleau-5, T13, Kenda Pershing, Ansley, Onyx-Tavernier, Jolin and Brett-Tretheway.